Piano tuning in Montgomery County, Maryland, Piano tuner with over 35 years of experience in tuning pianos in the Montgomery County, Maryland, expert piano tuning, repairs and maintenance. Piano Tuning & Repair Services. 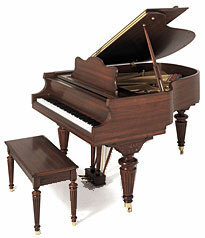 Providing Piano Repair and Tuning services to Montgomery County, Maryland, Northern Virginia and Washington, DC area. We have tuned pianos for over 25 years. Pianos like stable consistent temperatures just like humans! Place your piano away from places where temperatures vary widely during a 24-hour period or where extremes of outside temperature occur. Keeping pianos away from windows, outside doors, fireplaces, heating or ac vents is a start to keep your piano in prime condition. Since pianos don't like extremes of climate, if you live where it can be damp (many parts of the US), you probably should investigate a dehumidifier for your piano. If your area has year-'round low relative humidity, you may need a humidifier. Some areas of the country may need both! Consult your tech. Place your piano away from sources of humidity: kitchen, bathroom, swimming pools. Digital pianos and electronic keyboards never need tuning. Visit our website for more information about our piano tuning services. whether your piano is an upright or grand. The name of the piano is helpful, but not essential. state any additional problems beyond the tuning, such as; keys that do not play right, may be stuck, sluggish or broken. In emergency situations when a piano must be serviced for a recital, class or performance at the last minute, our tech will do everything possible to accommodate you. The tech will work with you as much as possible to accommodate your schedule, but we hope you can be reasonably flexible as he has to consider his travel route for the day. WHEN THE TECH ARRIVES, please have everything removed from the top of the piano so he can have access to opening it up. Please be sure that the environment is as quiet as possible so that he can hear the piano as precisely as possible to do the best possible job for your piano. A piano tuning means adjusting all the tuning pins (most pianos have about over 200 pins since many notes hit 3 strings at the same time, and all 3 strings must be in sync.). The standard concert pitch is A-440, which means that a piano in perfect tune, when the A above middle C is struck, would vibrate at 440 times per second. All other keys up and down the keyboard would be tuned in a ratio consistent with that. However, some pianos are so far below that pitch that a piano can only be tuned to itself so that it sounds good, or raised slightly toward concert pitch. To attempt raising the pitch to A-440 when a piano is severely flat could result in strings breaking or worse. No reputable technician would attempt to bring a piano up to pitch in a single tuning when the piano is severely below pitch. However, many households are fine with having a piano tuned to itself so that it will sound good. The major disadvantage is that you would hear a difference if attempting to play your piano along with a recording that was made on another piano. Most pianos can get by with a tuning once a year. It is recommended not to let a piano go too far beyond the year without being tuned, regardless of whether the piano is played much or not. The tensions on the strings have a natural tendency to relax and without regular tuning, the strings might lapse into becoming too difficult to tune. In some severe cases where a piano has not been tuned in a long time, the technician may recommend the piano be tuned again in 6-months. Some musicians prefer to have their pianos in shape as much as possible and consistently have their pianos tuned every six months. Most electronic pianos do not need tuning (there have been some rare occasions where they do). Is it wrong to place a piano against an outside wall? How far from the fireplace must it be? Can I keep my piano in an unheated room?" Pianos are mostly wood and are greatly affected by seasonal change. Variations in the air's relative humidity, and to a lesser extent temperature, cause a piano to go out of tune. In the long run, repeated swings in relative humidity can cause damage to the finish, cracking of the wooden soundboard, and even structural failure. So, when locating your piano, try to choose a spot with the fewest drafts, no direct sunlight and stable temperature and humidity. Common lore says that a piano should always be on an inside wall. This is not necessarily true. If your home is well insulated, an outside wall will usually be fine, as long as the piano is not directly in front of a window or close to a furnace vent or other source of warm (or cold) air. Evenness of humidity and temperature is what you should strive for. Thus, a piano in an unheated room is better off than one in a family room that's alternately heated, cooled and ventilated with open windows. If the piano is facing a fireplace or heater and its surface feels warm, it's too close. Avoid direct sunlight; it will wreak havoc on your piano's tuning and eventually fade and crack the finish. Consistency is more important than the actual levels of temperature or relative humidity. If you can't find a suitable location, have a climate control system installed in the instrument itself. These units can greatly improve tuning stability and other climate-related problems where it's not practical to control the environment of the entire house. Your piano is an investment in your future. It can bring you and your family a lifetime of music, adding immeasurable joy and beauty to your home. Because it also is such a large investment, it should be maintained with the utmost care. Regular servicing by a qualified tuner-technicians will preserve your instrument and help; you avoid costly repair in the future. Because your piano contains materials such as wood and felt, it is subject to change with climatic conditions. Extreme swings from hot to cold or dry to wet cause its materials to swell and contract, affecting tone, pitch and action response of touch. You can reduce the severity of these effects by placing your piano near a wall away from windows or doors which are opened frequently. Avoid heating and air conditioning vents, fireplaces and areas which receive direct sunlight. Your piano will perform best under consistent conditions neither too wet or dry, optimally at a temperature of 68 degrees F and 42 percent relative humidity. While pianos generally fall into vertical and grand model categories, each manufacturer selects its own materials and utilizes its own unique scale and furniture designs. Every piano requires a different level of maintenance, depending upon the quality of materials used, the design and level of craftsmanship. Manufacturers can provide general advice on tuning frequency but your technician can give specific recommendations based upon your usage and locale. Here's what some of the major piano manufacturers recommended. wires stretch slowly all of the time. Technically speaking, the piano is going out of tune as the tuner leaves your home after tuning your piano. This is a piano tuners' chief job security. weather and climate changes work against the piano. In the winter you heat the house up. The relative humidity goes way down, and the wood frame of the piano shrinks. In the summer, the humidity goes way up at times, and the wood frame expands. The result is that the wires and tuning pins slip as the piano goes through these cycles. I am told that some concert grand pianos can go through extremes of as much as a half inch in their overall length. That's a lot of movement. you pound on it, and you may move your piano around from time to time. Playing a piano is not the worst thing for it. The weather changes are the worst. Of course, if you have a big fisted virtuoso beating out top volume all the time, that is sure to knock it out of tune in several notes. age gets to a piano. The tuning pins are not mounted in the metal harp as it appears when you look at the inside of the piano. The pins go through those holes and are mounted in a big block of wood.